Imaging from the worst place on Earth? Possibly! Welcome to my image blog from Lancashire, UK. Living in Lancashire does make imaging a challenge. Our incessant damp cloudy weather is legendary and coupled with light pollution probably as bright as can be found anywhere (I am 15 miles NW of the centre of Manchester) makes for testing times! Add to that flight path one with constant aeroplanes, which is why it has been suggested as possibly the worst place on Earth for imaging. Now the good news. With modern light pollution filters we can still produce excellent results - at least when the clouds clear - but of course we cannot match dark sites - I avoid looking at images from such sites as they are very depressing and un-representative of what the rest of us have to suffer! So if you too live in cloudy suburbia then I hope the following images offer some encouragement. I often shoot the luminance and the colour simultaneously - there are not enough clear spells to alow the luxury of shooting separately. Having two telescopes and two cameras is obviously essential for this - as is having a dome slot wide enough for both to have a clear line of sight. The luminance is usually taken with the RCOS + Apogee Alta and the colour Takahashi + Canon 40D. Despite their disparate focal lengths this works reasonably well as the Canon has 5 micron pixels (plate scale 2 arcsecs/pixel) and the Apogee 18 micron ones when binned 2x2 (plate scale 1.3 arcsecs/pixel). I find binning essential to maximise signal and improve the signal-to-noise ratio. The images are all taken from my back garden and appear in order of me processing them - we have plenty of cloudy nights for that. I use a combination of IRIS and Maxim for processing with final tweaks in Photoshop CS2. To get rid of the light pollution takes much trial and error. IRIS scores here with several options but processing often comprises many nights work - certainly always longer than the actual taking. The exception are images taken with an h-alpha filter which is a superb light pollution filter. It also permits imaging with strong Moonlight present - isn't it funny how it always seems to be clear at full Moon! Discovered by William Herschel in 1785, NGC 246 is located in Cetus and never gets very high in the UK. Its central star is actually a blue and yellow close double which I have just about managed to resolve. Presumably the blue one is the real central star and the yellow one just a line of sight pair. The blue one seems to be fading fast. In 1930 it was 9th magnitude, by 1969 it was down to 11.2 and today it has dropped to around 12th magnitude. It is one of the hottest stars known at 200,000 degrees. The central star is speeding through space at about 86 kilometers per second and as a result the material expelled from it piles up in front and spreads out behind it. The direction of the star's motion was determined by Hipparcos as 0.023 arcsec/year to the west (right). This has resulted in a definite oval shape. The leading edge is the brightest and closest to the star where it interacts, and is slowed down by, the inter-stellar medium. 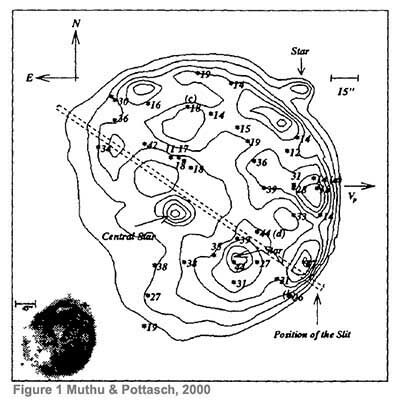 Whereas the trailing side is much more diffuse and somewhat transparent - see Figure 1 (right) by Muthu & Pottasch, 2000. Cass A is the last (known) supernova in our galaxy and it should have been visible from Earth around 1671. Amazingly there are no historical records of any sightings of it. There is a slight possibility that it was recorded as a sixth magnitude star 3 Cassiopeiae by John Flamsteed on August 16, 1680. Possible explanations lean toward the idea that the source star was unusually massive and had previously ejected much of its outer layers. These outer layers would have cloaked the star and reabsorbed much of the light released as the inner star collapsed. Its name comes from the fact that it is the brightest extrasolar radio source in Cassiopeia - in fact it is the brightest in the sky - or at least it was. Its flux is decreasing so it won't hold this record for much longer. Recently (2008), Krause et al. 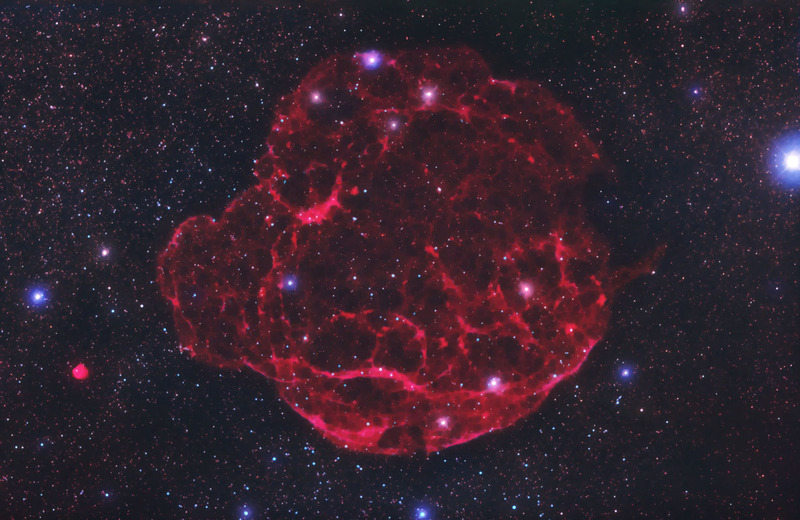 obtained an optical spectrum of the Cassiopeia A supernova near maximum brightness, obtained from observations of a scattered light echo - more than three centuries after the direct light of the explosion swept past Earth. The spectrum shows that Cassiopeia A was a type IIb supernova and originated from the collapse of the helium core of a red supergiant that had lost most of its hydrogen envelope prior to exploding. I started off with an h-alpha filter which recorded faint material to the north of Cass A but not much of the remnant itself. Not sure what elements were causing the main nebula to shine I switched to a luminance filter with maximum passbands - the IDAS P2 filter. This recorded the remnant much better so I kept going with this filter over several nights to get a total of 5 hours. 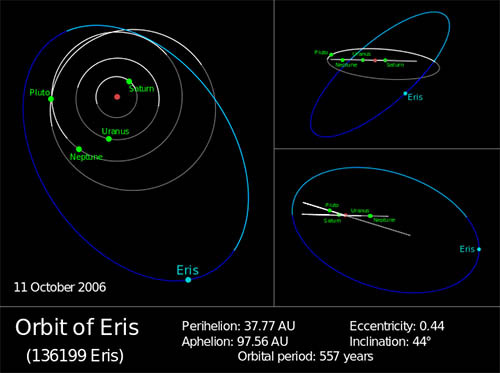 Eris is the most massive known dwarf planet in the Solar System and the ninth most massive body orbiting the Sun. Its mass is 27% more than Pluto although their diameters appear very similar - about 2300 km. As of 2014, its distance from the Sun is 96.4 astronomical units - roughly three times that of Pluto. Its orbit is very eccentric and inclined pointing to an encounter with Neptune in the early days of the solar system. It has one known moon, Dysnomia and it is its orbit that has enabled the precise derivation of Eris's mass. Eris was discovered by the team of Mike Brown, Chad Trujillo, and David Rabinowitz on 5th January 2005, from images taken on 21st October 2003. 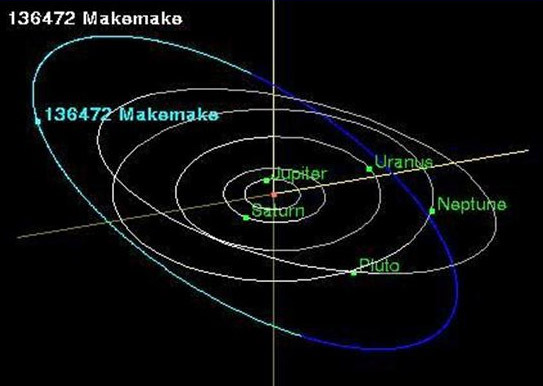 The discovery was announced on 29th July 2005, the same day as Makemake and two days after Haumea, due in part to events that would later lead to controversy about the latter. The search team had been systematically scanning for large outer Solar System bodies for several years, and had been involved in the discovery of several other large Trans Neptunian Objects (TNOs), including Quaoar, Orcus, and Sedna. The team had also discovered Haumea but were awaiting more observations when a Spanish team announced its discovery. It later emerged that the Spanish team had accessed the Brown team's data so the actual discoverer of Haumea has never been officially ratified but left blank. The galaxy dead centre is PGC 1072733 with a redshift of 0.018866 and magnitude 15.83. 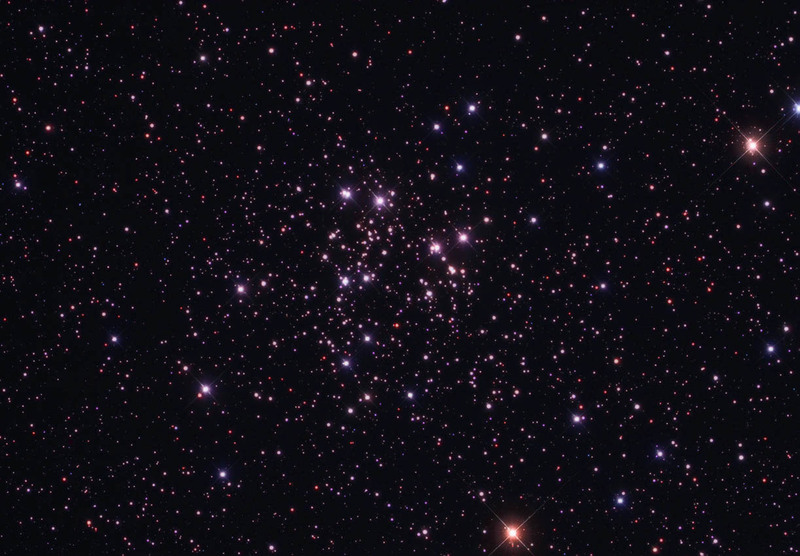 Cassiopeia is full of spectacular open clusters and NGC 663 is definitely one of the best! I "discovered" this cluster over 40 years ago when sweeping Cassiopeia with binoculars - it stands out much more than the nearby M103. One of the best Caldwell objects for binoculars or small telescopes and one that doesn't need pristine dark skies. It is a very young cluster at 31 million years old but quite distant at around 6800 light years. 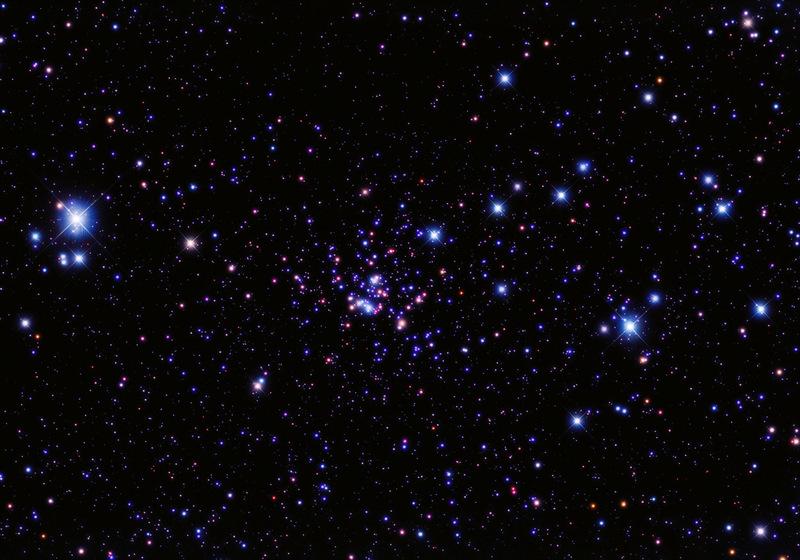 A much studied cluster or at least the Be type stars within it are. A very recent paper by Yu et al. (2014) found/confirmed 34 Be stars. However, despite what is often reported, NGC 663 does not have an abnormally high proportion of this type. In fact they found that they represented only 3.5% which is lower than other clusters they compared it to. Exposure: RCOS 12 x 5 mins with IDAS filter. Tak 12 x 5 mins with UHC filter. 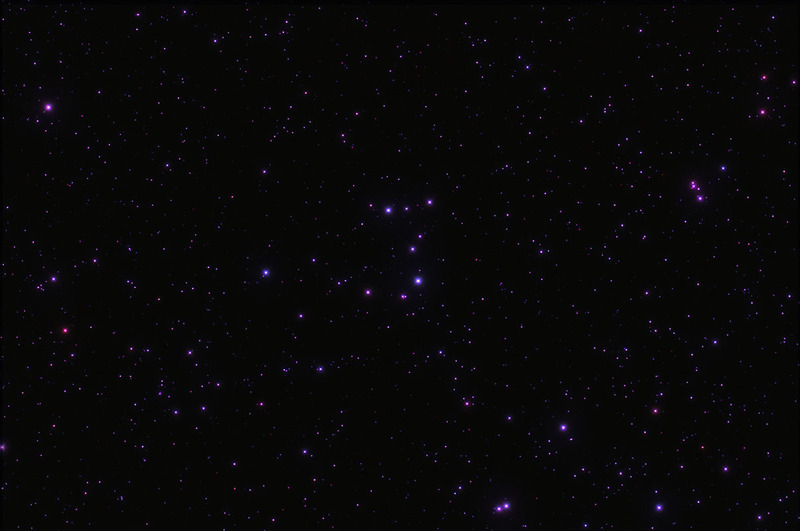 Cassiopeia is full of spectacular open clusters but NGC 559 is probably not one of them! It is, however, an interesting cluster and well worth searching out. 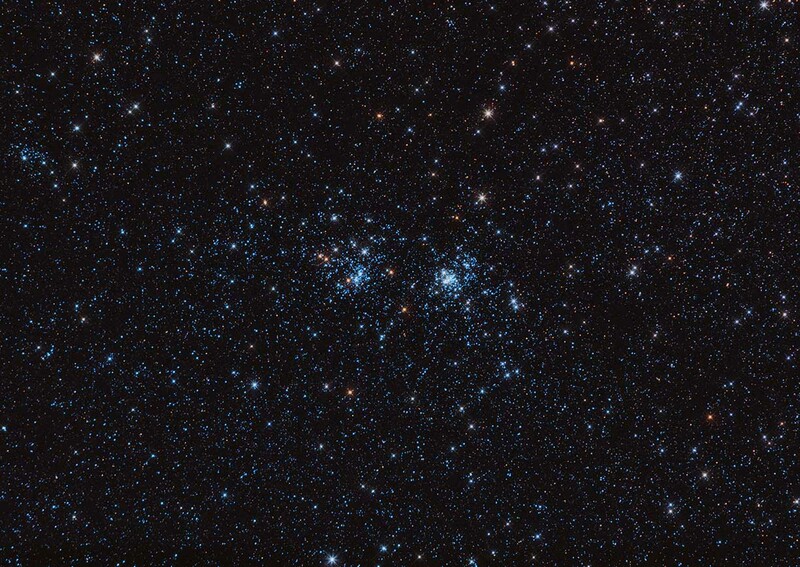 Note the prominent white stars are most likely foreground objects and not part of the cluster. It is very reddened making its age and distance somewhat tricky to work out. When I wrote Observing the Caldwell Objects in 1999, it was thought to be very old (1.3 billion years) and relatively near by (400 light years) but subsequent research by Ann and Lee (2002) has changed that. It is now believed to younger at 400 million years but much further away at around 7500 light years. So the reddening of the cluster is more down to distance than extreme age. Exposure: RCOS 13 x 5 mins with IDAS filter. Tak 13 x 5 mins with UHC filter. The other globular cluster in Delphinus. 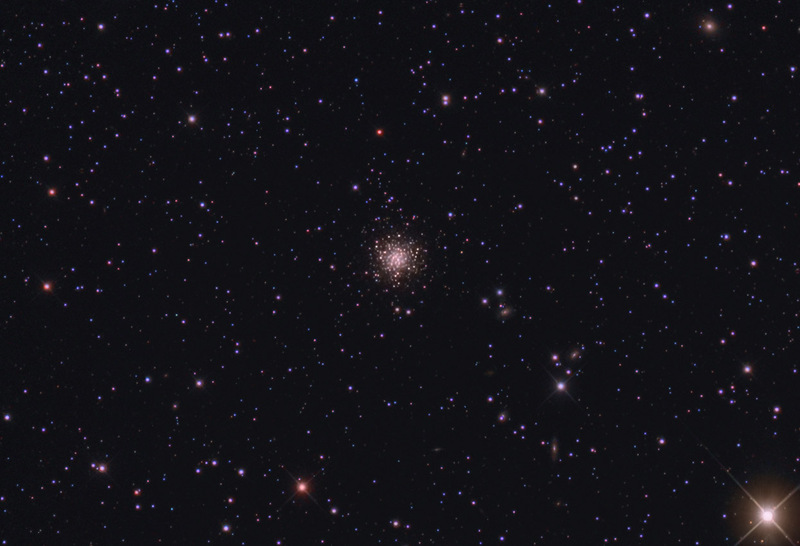 It is one of the least studied globular clusters in the northern hemisphere and it was not until 1973 that the first colour-magnitude (CM) diagram for it was produced. 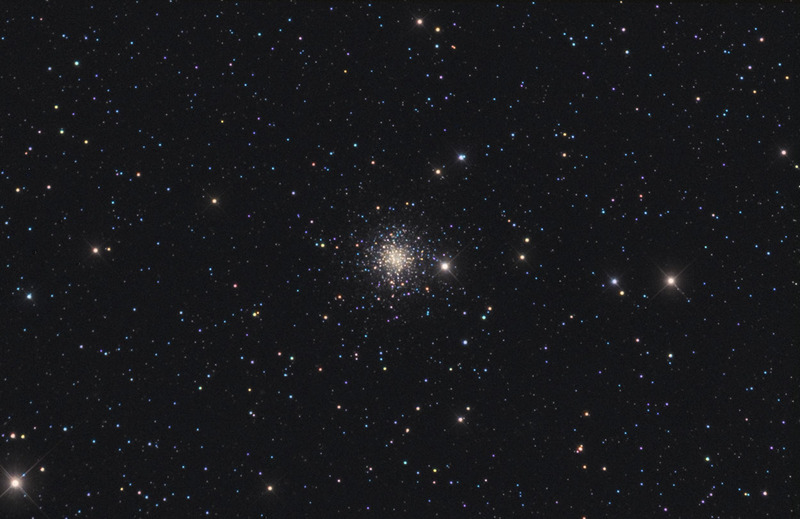 This was derived by Harris & Racine, the former is of course better known today for his definitive catalogue Globular Clusters in the Milky Way (1996/7). The distance to the cluster was determined using both the CM diagram and by studying the periods and luminosity for 31 RR Lyrae variables known in the cluster. The distance to the cluster they determined to be about 50,000 light years - fairly remote but no where near as remote as NGC 7006. More recent research by Piotto et al. (1999) used Hubble Space Telescope observations of the central region of NGC 6934 where they found many blue straggler stars (BSS). Using observations of over 8,000 stars they were able to calculate a deeper CM diagram plus the luminosity function. From these, they were able to derive the cluster's age, which they placed in the range of 13 to 16 billion years. Since then the age of the universe has been determined to be 13.75 billion years so perhaps the cluster's age is most likely to be 13 billion years. I wasn't planning on a short exposure but clouds rolled in twice. This was all I got over 2 nights and I had to wait 32 days for the second clear spell! For curiosity I processed what I had to see just what was possible. Exposure: RCOS 2 x 10 mins with IDAS filter. Tak 3mins with UHC filter. Located in Delphinus, NGC 7006 is largely ignored by amateur astronomers as its visual appearance, in all but the largest Dobsonian, is very under-whelming. It is one of those objects that is more interesting when bit of background knowledge is learnt. NGC 7006 resides in the halo outside of the main disk of the Milky Way. Currently it is 135 000 light-years away and is one of most remote known. This is almost as far as our satellite galaxies, the Magellanic Clouds. In fact its orbit is so eccentric that at its farthest it will be more remote than these galaxies. That eccentric orbit is best explained by it having formed as part of a dwarf galaxy which was subsequently absorbed by the Milky Way. Also in the image are several background galaxies. Redshifts indicate distances of 380,000 to 560,000 light years. Exposure: RCOS 14 x 10 mins with IDAS filter. Tak 14 x 10 mins UHC filter. The forgotten planetary nebula of autumn. It's just as bright as its popular neighbours, M27 and M57 so why not seek it out? It is its spectacular colour that makes it worth viewing. Many books call it aquamarine but blue is good enough for us in Lancashire. NGC7662 is a triple-shell nebula with a bright inner shell (18" x 12") enveloped by a outer shell (30" x 27") and surrounded by a faint spherical halo 134′′ in diameter (Chu, Jacoby, & Arendt 1987). The inner shell appears as a bright rim. In contrast, the outer shell appears as an envelope attached to the inner shell. A feature of the outer shell is the presence of FLIERs or“fast low-ionization emission regions.” These are just visible in my image as brighter pinkish patches. To see them in their glory then the Hubble Telescope is needed. What shape is it in 3D? Guerrero et a l. resolved this in 2005, decalring that both the inner shell and the outermost layer of the outer shell can be modeled as an "expanding prolate ellipsoidal shells with the northeast end of the major axis tilted toward us". So now you know. Discovered by William Herschel in 1782 with his 18.7 inch telescope in Aquarius. He observed it several times at up to 932x magnification - don't try this at home! However, it is a small nebula and without magnification it looks like a star. It was Lord Rosse who gave it its name. He must have been able to see the ring like extensions on either side (ansae) that resemble Saturn when edge on. These are difficult to see and it took Lord Rosse with his giant 6 foot telescope to see them. Research: The following is by Profesor Jim Kaler. The hot (90,000 Kelvin), blue, 13th magnitude star at the centre is the old nuclear-burning core of what was once an extended giant star, while the surrounding nebula is the inner part of the star's lost envelope that has been structured by the remaining star's hot wind. The distance is not well known. If at 2000 light years, the nebula is 3/4 of a light year long. The central star seems faint to us only because of its distance and because the vast majority of its radiation comes out as energetic ultraviolet light. In reality, the star thousands of times more luminous than the Sun. Still heating at constant luminosity, the star will eventually cool and dim to become one of the many white dwarfs that dot the cosmos. The ansae, called "FLIERS," are high-speed jets shot out of the central star, probably along the star's polar axis. While NGC 7009's are the most prominent, they are seen in a number of nebulae, notably NGC 3242, NGC 6543, and NGC 2371- 2. The central star is not easy to record and it took a separate luminiance exposure to show it (just) - neither H-alpha or the OIII recorded it obviously due to it being brightest in the UV. Also prominent in the image is the Crescent nebula (NGC 6888) energised by a Wolf-Rayet star. 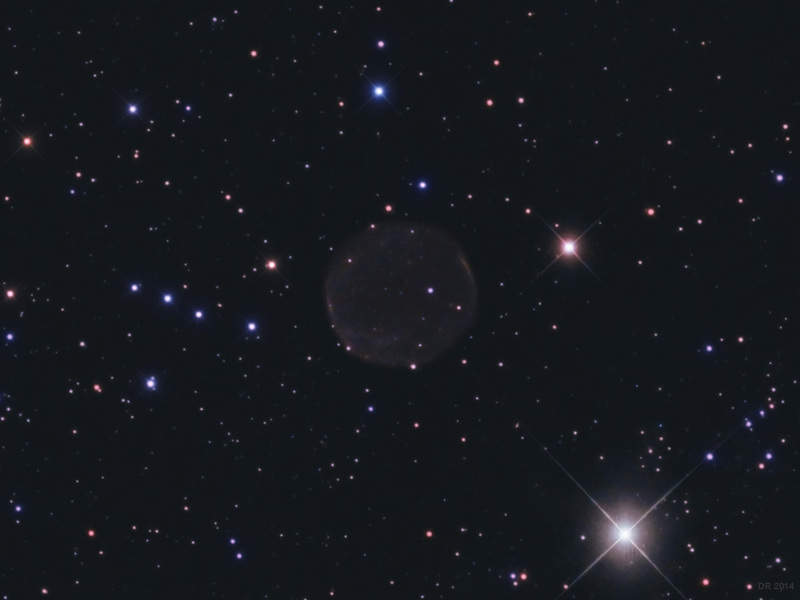 The original h-alpha image also records the extremely faint Soap Bubble nebula. Exposure: 4 hours total with UHC filter (at f4.5) and H-alpha filter (at f/2.8). This combination HII emission region and blue reflection nebula (also called LBN 129 and DG 159) is ionised by the B0.5V star HD 231616. Appearance-wise, it does have a great deal in common with the real Cocoon Nebula (IC5146) and hence its semi-official name of Little Cocoon Nebula. With the current distance estimate of 3500 light years, it appears to be near the Vulpecula OB4 association although it is actually in Sagitta, not far from the Coathanger asterism. Research data for this object is limited but there is one professional paper "A multiwavelength study of the star forming H II region Sh2-82" by Nai-Ping Yu and Jun-Jie Wang (2012). They found the nebula contains 2 molecular clumps both containing many Young Strellar Objects (YSOs). The bright star to the east (left) is mag 7.47, type K0, and makes imaging a bit tricky. Watch out for ghost reflections that can look like new comets! Telescope: RCOS 12.5 inch at f/9 & Takahashi FSQ106. Camera: Apogee Alta U9 & Canon 60D. I had taken the H-alpha image way back in 2009 but never got around to taking the colour. When checking oustanding jobs during the summer break, I realised that I had actually taken the colour information last winter so I have combined the two at long last. 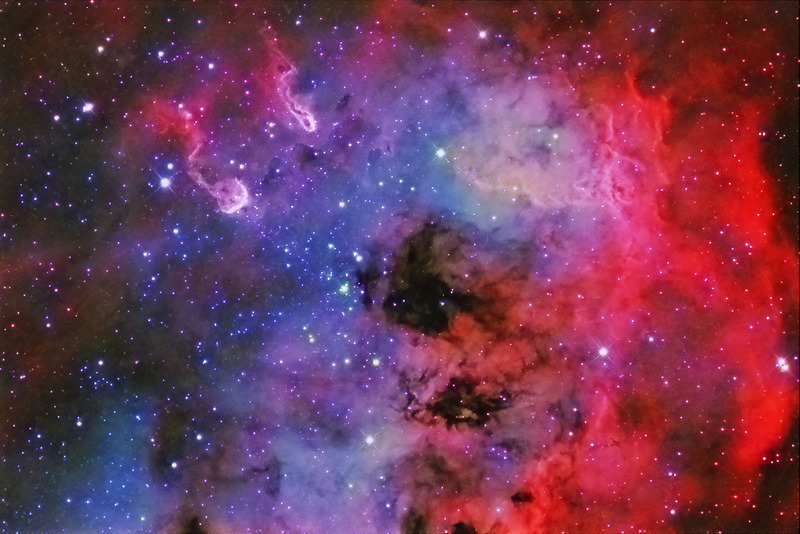 The bright emission nebula IC 410 lies about 12,000 light-years away in the constellation Auriga. The nebula of mainly hydrogen gas and is over 100 light-years across. Its complex structure is sculpted by stellar winds and radiation pressure from the embedded very young open star cluster NGC 1893 (centre-left). This formed in the interstellar cloud only around 4 million years ago and that radiation pressure from it has created two relatively dense streamers of material trailing away from star cluster's centre. These are the famous "tadploes" and are about 10 light-years long. Camera: Apogee Alta U9 & Canon 40D. 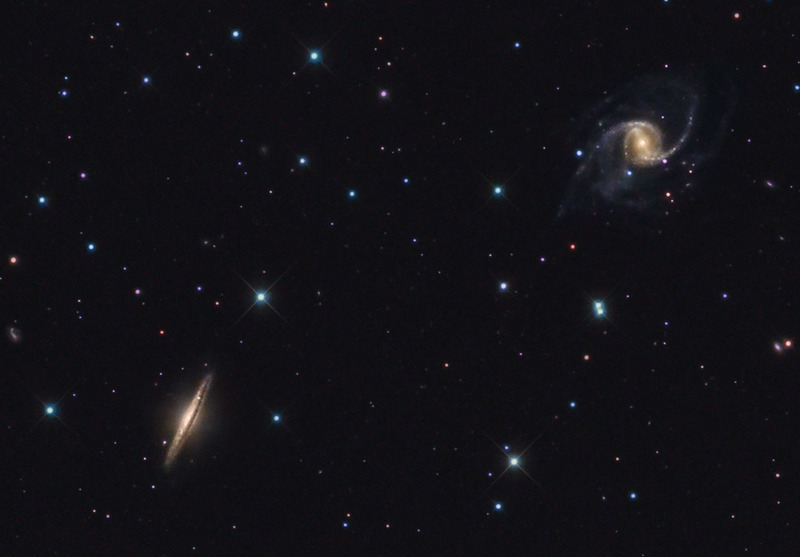 A contrasting pair of spiral galaxies - one face-on (NGC5905) and one edge-on (NGC 5908). Both are around 160 million light years distant so may be an associated pair. 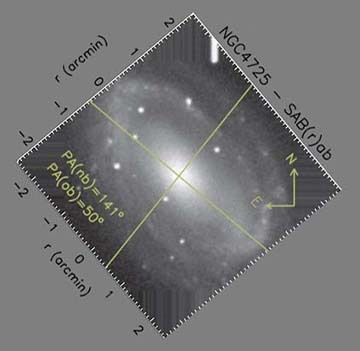 NGC 5905 is classed as SB(r)b ie a barred spiral with ring (see below). 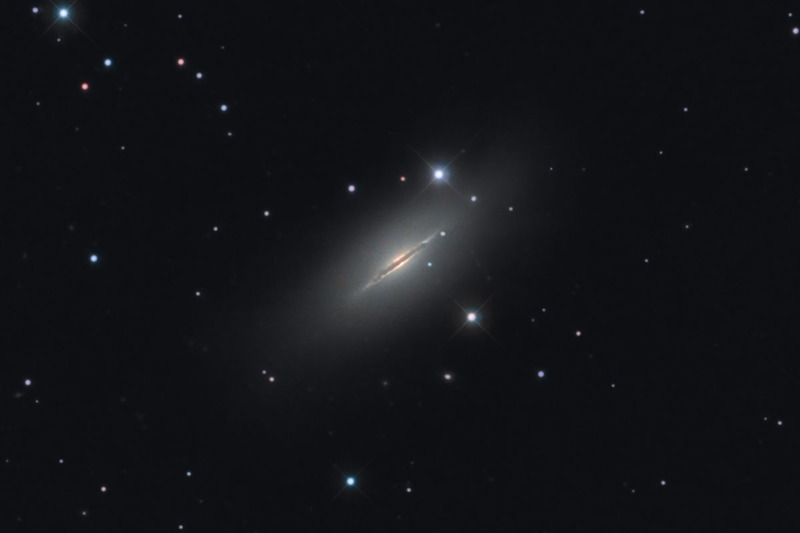 NGC 5908 is classed as Sb (see below). NGC 5905: Nuclear rings are viewed as a type of starburst, consisting of distinct compact areas of young massive stars near the centres of spiral galaxies. These starbursts are attributed to a star formation rate (SFR) that significantly exceeds the average found among normal galaxies. They can dominate the overall star formation in early Hubble type barred spiral galaxies and dramatically alter the structure of the host galaxy. Typically located within the central kiloparsec, nuclear rings contain a mixture of neutral and ionized gas and dust. The great majority of nuclear rings are found in barred spiral galaxies, where the bar provides essential fuel for the formation and evolution of the ring via shock-induced channeling of disk gas to the nuclear regions. Reference: A Connection between star formation in nuclear rings and their host galaxies - Mazzuca et al., 2008. NGC 5908: The central bulge is small enough to put the galaxy very late in the Sb morphological box, or more appropriately in the Sc box. However, the lack of lumpiness in the disk (seen despite the high inclination angle) precludes the type being as late as Sc which the small bulge size would otherwise suggest. It is very similar to M104, the Sobrero Hat Galaxy, but is 5 times further away. This is my last image of the spring - the observatory is now shut down for the summer twilight period. It gives a chance to catch up on maintenance and updates. 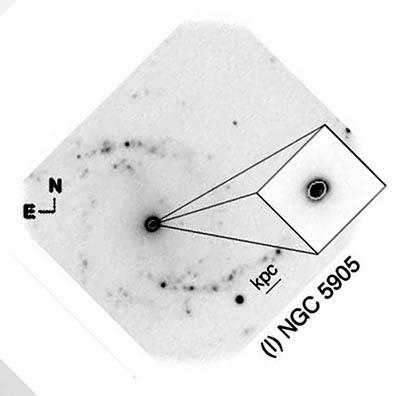 Nuclear Ring in NGC 5905 - copyright Maxxuca et al., 2008. Chart rotated to give north at top as per my image. The Missing Messier M102 - NGC 5866? This is one the biggest controversies in popular astronomy. One thing is certain, despite what some claim (Sky & Telescope March 2005) the mystery has never been solved. All solutions have to choose to ignore conflicting evidence and just plain errors - depending which you overlook leads to different conclusions. 102. Nebula between the stars Omicron Bootis and Iota Draconis: it is very faint, near it is a star of 6th magnitude. The evidence that M102 was a duplicate of M101 emanates from a letter sent by Mechain 2 years later stating M102 was a chart error and saying it was a second observation of M101. Subsequent authors have concentrated on this letter and overlooked the inconsistencies in this solution. Messier (after Mechain's report but before Mechain's letter) observed M102 and added a position for it in handwriting on his personal catalogue. There is nothing at his position but the only 2 galaxies bright enough for him to have seen in the vicinity were M101 and NGC 5866. But M101 is about twice as far away from Messier's position as NGC 5866. In addition, remember that nearby 6th magnitude star? The nearest 6th magnitude star to M101 is 2 degrees away whereas NGC 5866 has a 6th magnitude star (actually 6.86) only 30 arcminutes away. On balance, there is a reasonable possibility that Messier did observe NGC 5866 thinking he was observing Mechain's M102. NGC 5866 belongs to the poor group LGG 396 which includes two main companions, NGC 5907 (Sc) and NGC 5879 (Sbc). NGC 5866 is classed a S0 or lenticular galaxy. 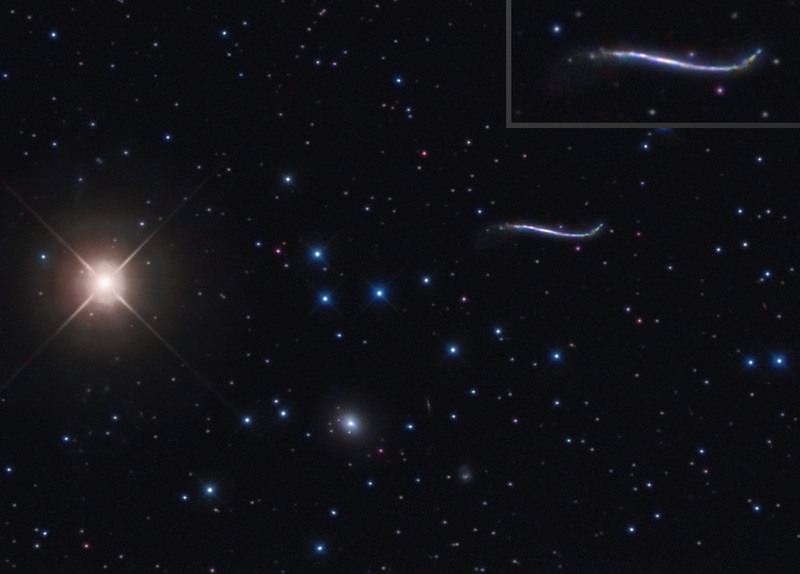 Living at the intersection of spirals and ellipticals on the Hubble tuning fork, lenticular galaxies are thought to be remnants of spirals after star formation has ceased or has slowed down substantially. 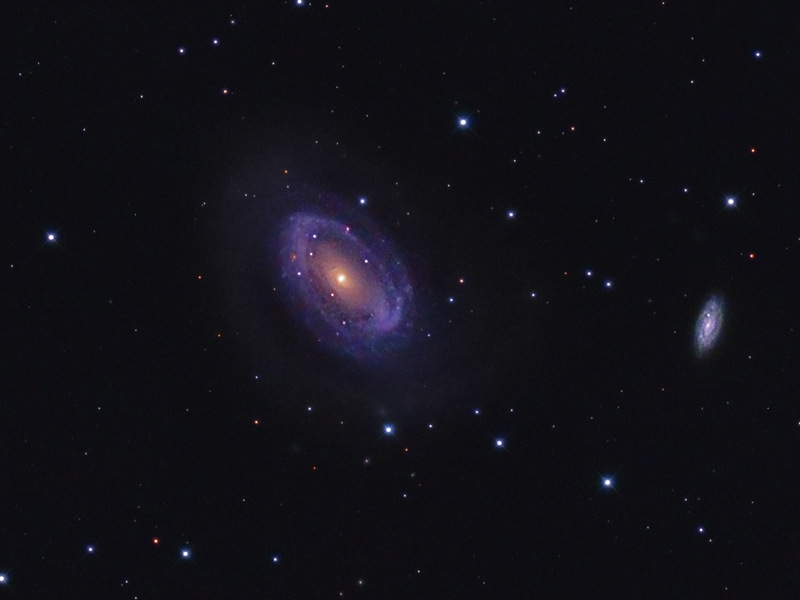 The NGC 4725 (centre galaxy) was classed as a Sb/SB(r)II barred spiral by Sandage (1996). Its location has lead to its assignment to the Coma-Sculptor cloud. NGC 4725 (and 4747 out of picture) are relatively isolated dynamically from the remainder of the cloud (e.g., Zaritsky et al. 1997) and comprise what has come to be known as the Coma II Group of galaxies (Tully 1988). NGC 4712 (right galaxy) is a background object with a redshift around 4 times that of NGC 4725. The original classification for NGC 4725 has been updated to SAB(r)ab pec. This implies a barred spiral with a ring and it is also classed a Seyfert Type 2. The pec(uliar) designation is perhaps due to it having apparently a single spiral arm. In 2008, De Lorenzo-Caceres et al. determined it was a double barred galaxy (see right) and measured the post ion angle of the two bars. 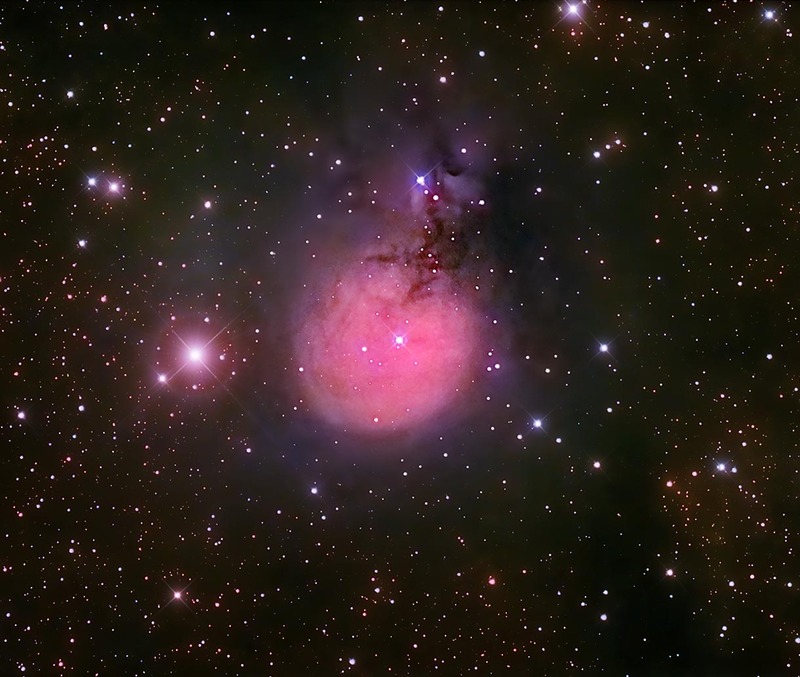 The central one is much the shorter and is just visible at the core of the galaxy in my image. 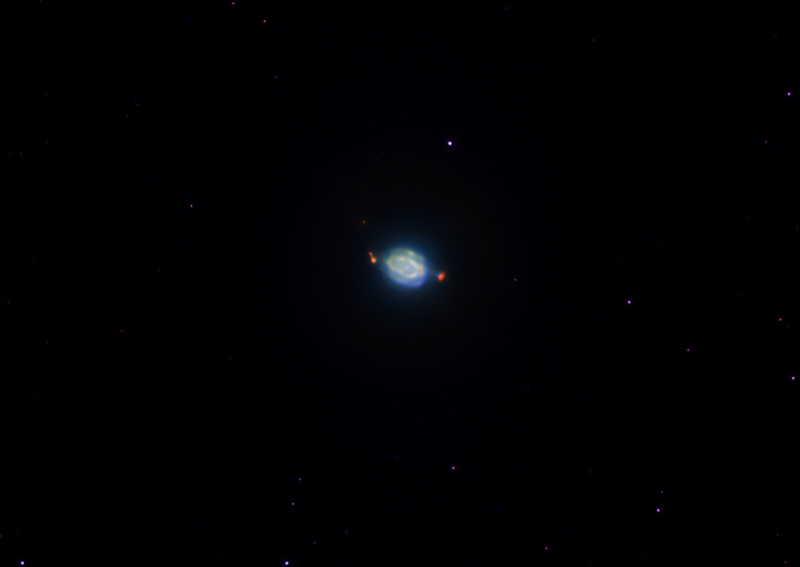 NGC 4725 was one of the HST Key Project primary calibrators for the infrared Tully-Fisher (IRTF) relationship. Gibson et al. (1998) derived the distance to NGC 4725 from Cepheid variables as part of the Hubble Space Telescope Key Project on the Extragalactic Distance Scale. Twenty Cepheids were discovered, with periods ranging from 12 to 49 days. Using Cepheids in the LMC as a reference, they determined a distance of 41 million light years. The distance to NGC 4712 is given as 240 million light years and its classification as SA(s)bc (NED). I tried the IDAS-P2 filter for this object in an attempt to reveal the faint outer arm(s) better but I am not convinced that it offers any advantages over the CLS filter which I used on the Tak. Copyright: De Lorenzo-Caceres et al. Figure 1 from De Lorenzo-Caceres et al. - "Stellar Kinematics in Double Barred Galaxies: the sigma-hollows" (2008). It shows the position angle of the two bars. The upper-left to lower-right line indicates the axis of the main (visual) bar whilst the other marks the axis of the much smaller inner bar. Note: I have rotated the figure to orientate north to the top to match my image. Something moves! This is an animated gif and the movement of Makemake is obvious in the images taken 4 days apart. Look near the centre as the date changes. Despite being a bit smaller than Pluto and further away from the Sun, dwarf planet MakeMake is surprisingly easy to track down at (currently) magnitude 16.9. What is even more surprising is that it wasn't discovered until 2005. It must have been recorded on many images prior to that date but was not spotted. My images each night totalled just over an hour but its movement was detectable (just) by blinking the first and last frame. Makemake is considered a classical Kuiper belt object, which means its orbit lies far enough beyond Neptune to remain stable over the age of the Solar System. Its discovery in 2005 (along with Eris and Haumea) was the final nail in the coffin for Pluto's status as a planet and lead to the new classification of dwarf planets. The Integral Sign Galaxy and it's 3(?) companions are located in Camelopardalis and together form a "poor" cluster of galaxies known as WBL 132 after White et al., 1999. The integral sign (UGC 3697) and the next largest, the disturbed face on spiral(?) UGC 3714, have very similar redshifts so are almost certainly interacting causing the odd appearance of both and the pronounced integral shape of UCG 3697 in particular. The membership of the group for the other two smaller galaxies is somewhat doubtful as neither have measured redshifts. The tiny edge-on galaxy looks very much like a background object. Attention was first called to this object by Burbidge in 1962 and the de Vaucouleurs published a note on its size and distance in 1968. However, a more definitive study was published in 1972 by Richer, Sharpless (of the nebula fame) and Olson in "On the Integral-Sign Galaxy, MCG 12-7-28". On the basis of the distribution of HII regions they concluded that the Integral Sign Galaxy was a peculiar galaxy and not an ordinary barred spiral galaxy seen almost edge-on. Today it is classified as a Sd Pec type - sort of hedging your bets. A very windy night so I chose an object at high declination thinking this would stop the telescope blowing about but it didn't. NGC 2392 was discovered by William Herschel in 1787 from Slough, UK. He thought the nebula surrounding the central star was its “atmosphere”. He didn't coin the name Eskimo - that is probably derived from its appearance in early Palomar pictures. Lord Rosse (and his assistant Storey) also observed it with the 6 foot telescope but could not “resolve it”. 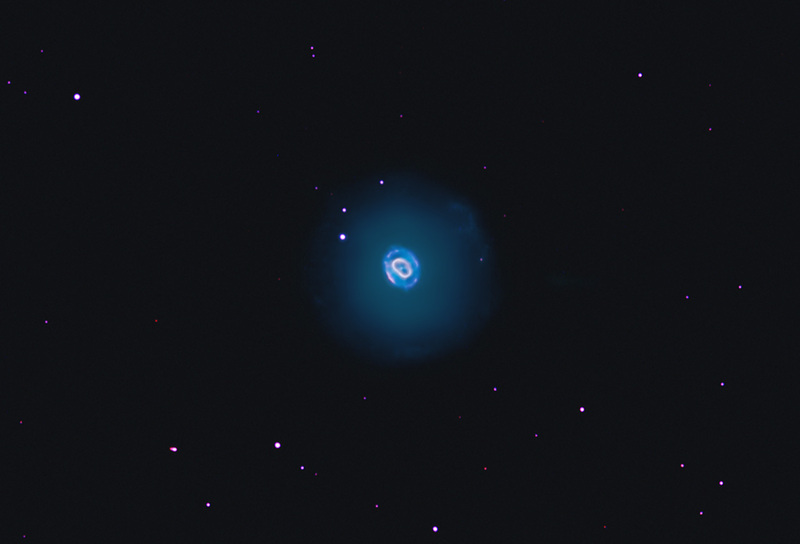 We now know it is a planetary Nebula (PN) with a prominent inner ring (the face) and a more diffuse outer halo (the hood). However, the circular morphology conceals much underlying complexity with bars, wisps and knots. It is also known as the Clownface Nebula or Caldwell 39 and is about the same size as Jupiter. It is in the constellation of Gemini. 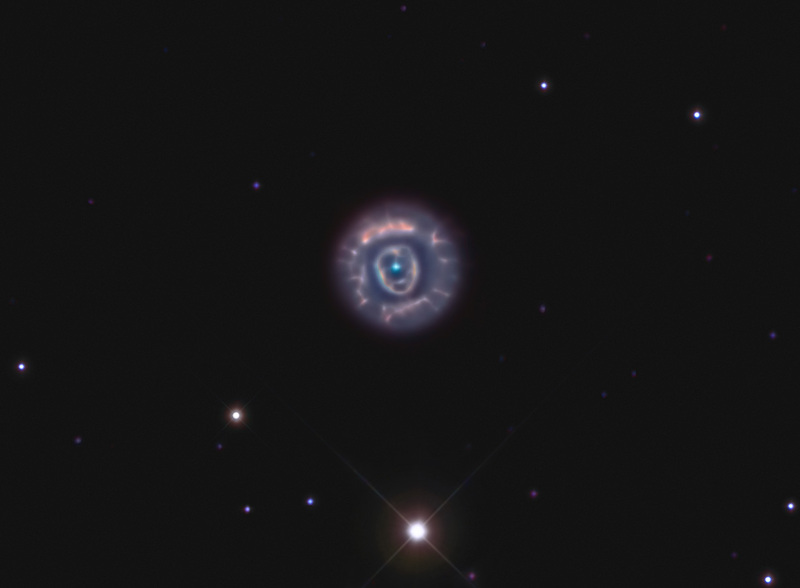 It would appear the Ant Nebula Mz3 and the Eskimo Nebula have a lot in common. Despite their totally different appearances, these planetary nebulae are really very similar objects just viewed from different directions. In the case of the Ant Nebula we see it sideways on whilst, in the case of the Eskimo Nebula, we see it pole end on. This perhaps surprising finding was discovered by Y Zhang et al. 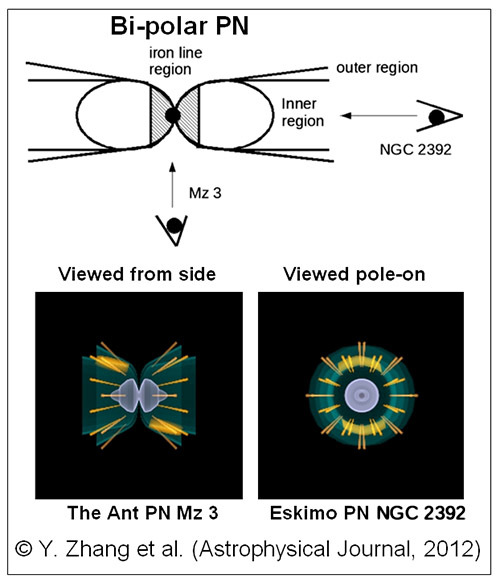 and published in the Astrophysical Journal in 2012 (see image on right). What is poorly known about it (and most planetary nebulae) is its distance. Estimates vary wildly between 2,000 and 7,500 light years. Probably a good compromise would be 4,000 light years. I had imaged this object in 2010 but was not happy with the result so returned again to it this year. I just got enough time between clouds for 12 x 15 minutes exposures with an h-alpha filter and as tracking was on form that night I got a much better image. I used the old images, Ha, OIII and CLS (luminance) to fill in the missing information, i.e. colour and the starfield. Exposure: 12 x 15 minutes with H-alpha filter + RGB from 2010. I have been trying for several years to get an image of this very large and very faint supernova remnant in Taurus. Believed to be around 40,000 years old i.e. the supernova that created it exploded that long ago. All that is left today is this faint filamentary structure and the rapidly spinning pulsar PSR J0538+2817. My new (secondhand) 200mm lens was perfect for this object. Although my exposures totalled over 8 hours the weather conditions were very hazy making for low contrast. Hopefully, there will be better conditions next winter. I suspect that a narrowerband h-alpha filter will be required for the best results. I have a year to save up. 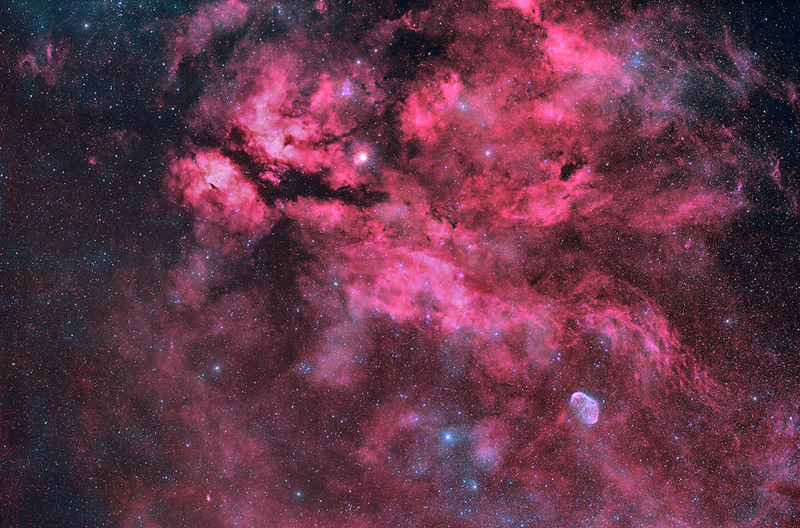 The small nebula to the left (east) is Sharpless Sh2-242. Exposure: 34 x10 mins H-alpha & 15 x 10 mins with UHC filter. Discovered (is that the right word?) in Spring 2013 by Professor Greg Parker. His quote: "I found this initially just by scrolling through "the Sky 6" looking to see if there was anything new and interesting to image. I couldn't believe it when a clear "3" flashed across the monitor." Because I cannot shoot west, I had to wait 10 months for it come into view for me but, sure enough, a very obvious "3" emerged. It just shows that there are probably more asterisms out there waiting to be spotted. Exposure: 16 x 5 mins with UHC filter. I know I am always going on about the Lancashire weather but even by our standards this has been probably the worst winter ever with non-stop cloudy/wet weather. 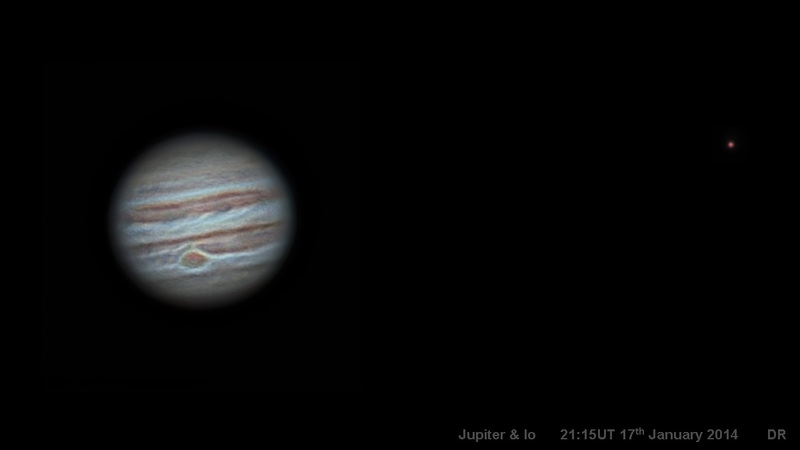 For this effort I managed a clear spell from 22:00 pm to 23:38 before the clouds returned again. This was one of my first shots with a Canon 200mm f/2.8L lens acquired on ebay. This lens has an excellent reputation for astronomy with several users claiming it works well wide open i.e. at f/2.8. I was very sceptical and used a UHC filter which hugely restricts the spectrum that needs to be focused. My thoughts are that it will focus blue and red very well but not at the same time. I will use f/4 for the next try. Exposure: 9 x 10 mins with UHC filter. There hasn't been a decent clear night in 2014 but I wanted to grab an image of this supermova. All I could manage was one 5 minute exposure between clouds and then the full Moon was present! Still this starburst galaxy is relatively bright so short exposures can still get an image. Sn2014J was discovered in the UK. On the night of January 21, 2014, a group of astronomy students at University College London were scheduled to learn how to use the university's Celestron C14. However, when clouds started rolling in their lecturer, Dr. Steve Fossey, decided to scrub the formal introduction and simply show the students how a CCD camera is used to take an image. 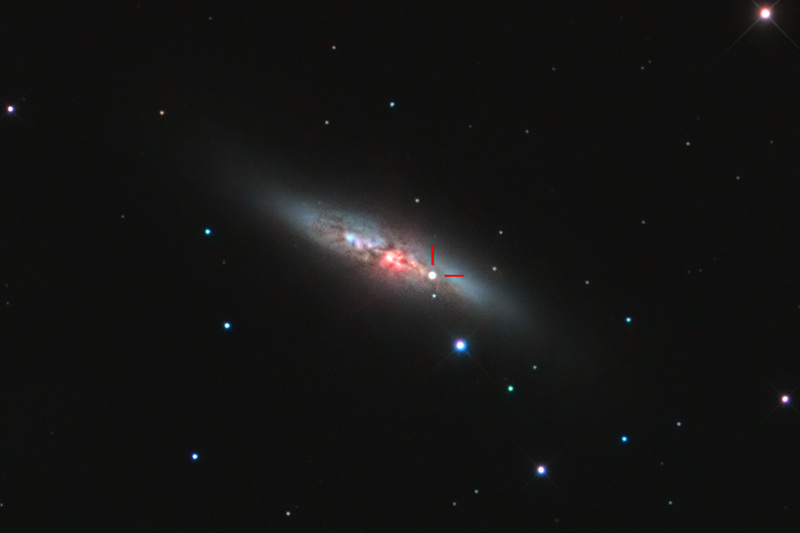 The students chose M82 and 10 minutes later the students had discovered the new supernova. It peaked around magnitude 10.5 a few day after and in my image I estimate that it now mag 11.0 or thereabouts. The Death Star from Star Wars? Actually the death of a star not the Death Star from Star Wars but it does look a bit like it. 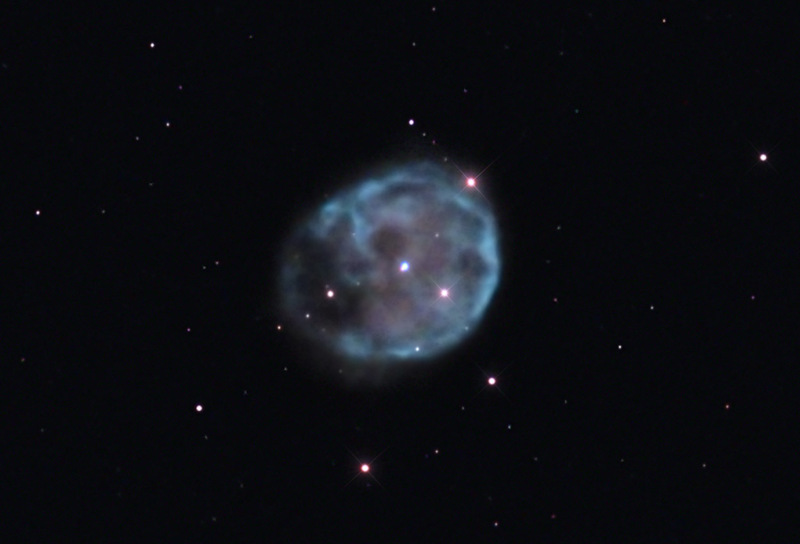 In real life it is the Planetary Nebula, Abell 6. 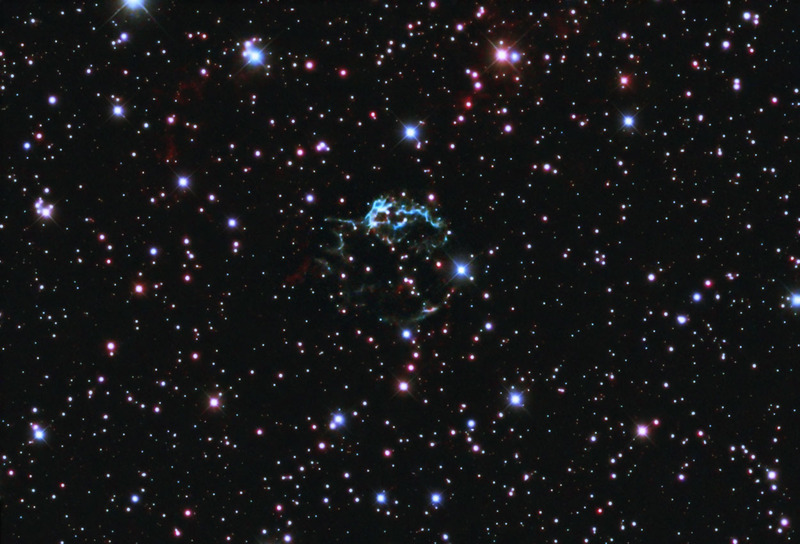 Located in Cassiopeia this ghostly planetary nebula has virtually no published research data for it. Judging by its symmetrical bubble shape then the central star is probably not in a binary system - stars in binary systems tend to produce more complicated and exotic nebula shapes. What is more definite is that it is around 2 arc-minutes in diameter , has a central star of magnitude 18.3 (B) and is very very faint. The usual weather problems meant 4 nights were needed for 4 hours worth of exposures. It was that time of year to dust off the old Celestar C8 and dig out the webcam for their annual planetary imaging turn. This year I had an electric focuser and a flip mirror. They don't half make life easier. Taken from Frettenham, Norfolk whilst grandsons sitting. Exposure: Best from 3000 frames at 20 fps. 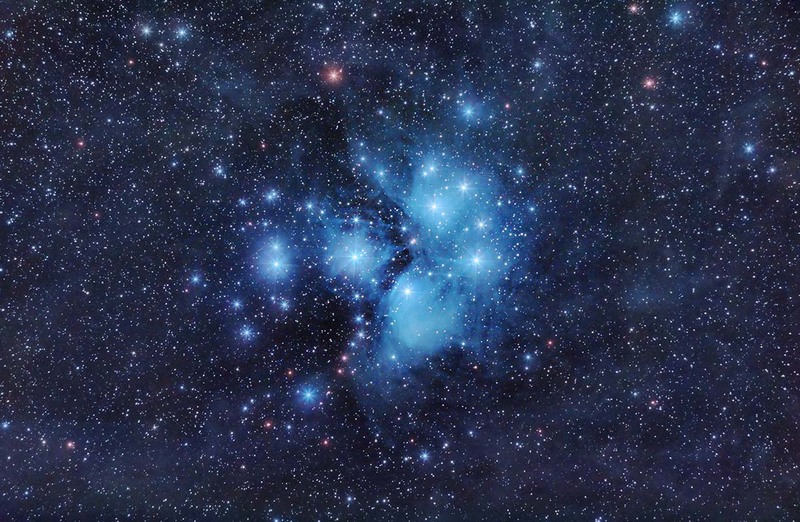 Latest thinking on the Pleiades seems to suggest that the nebula is not associated with the cluster - it just happens that the cluster is passing through the nebula at this particular time. The distance to the cluster is highly debated and disputed but 400 light years is probably reasonably close. Its age is around 115 million years - older than it used to be thought. Exposure: 5 hours with IDAS-P1 filter. A bit out of order but just a quick 1 hour exposure to test out my new (secondhand) Canon 60D. The results look encouraging - the fixed pattern (banding) noise seems much reduced on this model and the articulated screen means it's easy to see even after a meridian reversal. Sure the pixels are a bit small so probably snsitivity will take a knock but I am hoping it is more steps forward than backwards. Used IRIS for processing and the 18 mega-pixel images were no struggle at all. 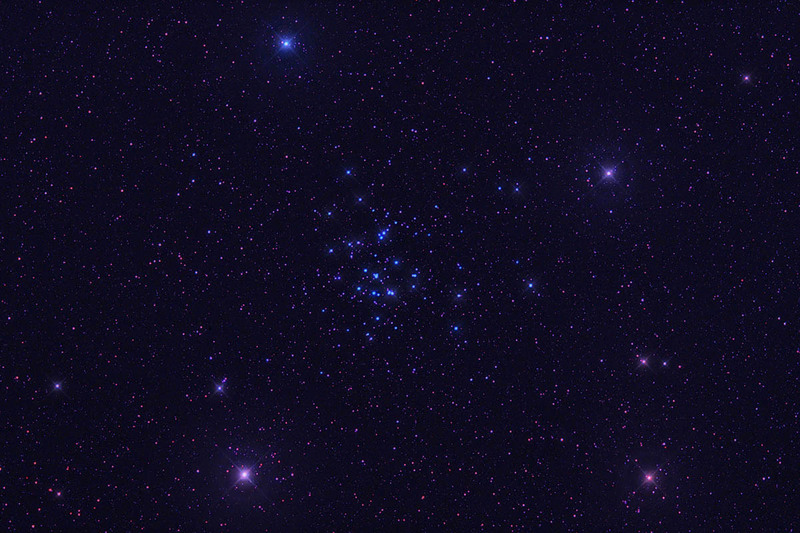 The cluster on the left (east) edge is NGC 957. Exposure: 12 x 5 mins with IDAS-P1 filter. Please remember these images are copyright David Ratledge. Contact me before any use is made of them.